"We have inspected around twenty of our wells. Most of them were in good condition. Only sometimes it was necessery to exchange some parts in the construction above the ground. Only in very few cases we had to deconstruct the entirety of the apparatus. 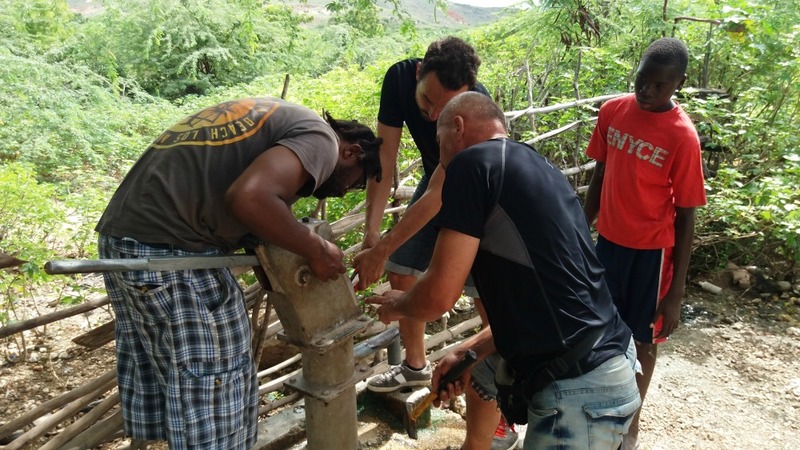 One could say that the work of czech technicians can hold on its own even in rough terrain," stated Ivo Roškanin, the participant in the mission and the manager of the project Praga-Haiti. Under his supervision the team has also repaired two dug out wells. "It was the mayoress of village Baie de Henne who asked us to secure the work on dug out wells damaged by the floods. It was necessery to clean the shafts filled with mud and gravel and also to repair the walls. However our highest priority was to acquire and install panels of reinforced concrete with installed pumps." Speciffied Roškanin and added that after the works were done the wells were again handed over to the local authorities. The local inhabitants were helping our team. The average number of employed locals was around ten per day. "According to our standarts the locals were not payed much, however to them it is a significant sum. It also relates to our opinion behind which we stand for a long time now. To help people in need in their own country and educate them in technical skills so they would be selfsustainable and will have no reason to leave Haiti." This time the team focused also on other activities related to water. In the area around the school in Baie de Henne, where two czech wells are located, the technicians have finished a pioneer project concerning the water wastes - The water waste has in the past soaked in the ground around the wells. Now it pours into a trough into a closed concrete circle which is 5 meters wide. This circle also serves as a place to sit on for young children from the school. Aditionally there are mangos planted in the centre of the circle. Project was watched over by Petr Vacek whos primary concern is to build a permanent base on Haiti. Vacek has stated: "We aim to build a sanctuary for those that would go out on field-missions. A place for them to rest after a job well-done in exhausting enviroment. Along with accommodation and an office there will be a workshop to repair and look after the equipment, storage or even a small version of technically specialized school. This is where the locals could learn the basics in craftmanship along with a few specialized subjects." Petr Vacek has worked during this mission mostly on a final plan of laying out the land - laying down the border pillars or preparing the logistical system of the construction. Project Praga-Haiti has send a second mission to Haiti this year.